The Little Blog Dress: Wedding Etiquette: To Thank Or Not To Thank...That is the Question. 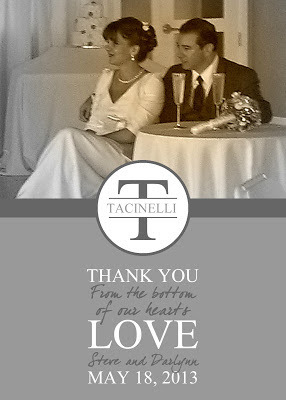 Wedding Etiquette: To Thank Or Not To Thank...That is the Question. My wedding planning is coming to a close as we finalized our thank you notes and will begin the daunting process of writing them out. Thanks to the amazing help of Wedding Wire, whatever anyone gave us along the way is in an amazingly neat and organized manner. I am so glad that my friend Heidi introduced me to this site. It answers every need of the obsessive compulsive in you. Aside from one or two that I forgot to input, it also very much gives you a great report of who was invited to your wedding and didn't give you anything. A glaring report that makes you question a lot of things. What you may or may not know about me is that I am solely materialistic. This means that I love things, all kinds of things but I love even more that I am solely responsible for buying said things. I have never relied on anyone to buy me the finer things in life and I take great pride in my 95 Juicy Couture suits from 10 years ago, 4 pairs of Uggs, the Ann Taylor Loft popup store that is my closet, and just a ridiculous amount of stupid handbags and designer sunglasses that I had to have. Because I bought them on my own. The point of this digression is that this isn't about the fact that you didn't buy us something off our registry. This rant may be a little bit premature, but according to this article, the people I am glaring at have about three more weeks to do the right thing. That whole one year thing? 1980 called and wants it mentality back. In today's day, with this little thing called the internet- the one year to give a wedding present is no longer a standard. I am gonna say it again, its not about the money or the gift...its about disappointing me and the fact that I really like having people in my life that do the right thing. Its about disappointing your parents because they should have taught you better. So my question to you is do I send them a Thank you card or not? Because I guess I do want to thank them for spending their day with us. See, I am not that horrible...just a girl who probably needs to be a little less ranty. Or maybe people don't know and I just was raised differently? Well, I would like to thank YOU for reading this and giving me your thoughts below! What a lovely picture! I got remarried 2 years ago (lost first hubby to cancer). This time had a bigger wedding as my hubby was never married before and wanted a more formal affair. I sent cards to everyone who came regardless of a gift. I know some came and didn't bring anything, and I was ok with it. They were invited as I wanted them to celebrate with us. Some of his friends are actors with no jobs, or elderly etc. I had one group of friends give us a gift over a year after the wedding. (14 months I think). They got together and put together a basket of things from the registry and lots of gourmet food stuffs. I then wrote notes again thanking for the gift. It is such a time consuming thing, but worth it in the end. I don't remember what the thank your looked like after awhile, but I do remember when I wasn't thanked. Good luck! Much happiness to you!